I am from Salem, VA. It is an extremely awesome place filled with close friends and family. The population is around 25,000 people which feels like a lot less than it really is. Pretty much everywhere you go you see people you know. And most of the time you know the people that are working where you are at also. There is an image that the city officials sometimes choose to put on the front of our newspaper. It’s of a baseball stadium we have in town. 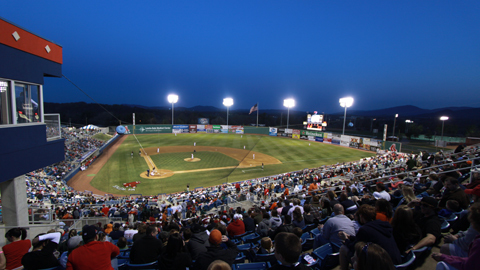 We just happen to have a minor league baseball team called the Salem Red Sox, that no one is very interested in. I think that the city manager makes a huge mistake in putting the picture seen above on the front of our city news letter because it is an inaccurate representation of this town and what we care about. Around here we care about football on Friday nights and that is it. Any sporting events you go to in this city there will maybe be a couple hundred people there. But on a Friday night in Salem there is at least 15,000 people packing the stands waiting to see the Spartans play. So why in the world the city manager doesn’t use a picture like the one below we will never know…. Its the only thing that shows what this city is really about.